In 2016 some members of the ATM group at the Munich "Volkssternwarte" started a joint project. Originally we planned to build five equal telescopes with the experienced telescope makers Martin Brückner and Stefan Griesing and novices. Well into the project one more person joined in. The plan was to create good performance telescopes that fit into a modest backpack so they can easily be carried on a mountain hike or as hand luggage on a flight. The initiators of the project were looking for the best balance between aperture, f/ratio, number of truss poles, truss length, transport dimensions, and transport concept. Such a minimalistic travel Dobsonian must be planned in detail, because nearly every part depends on every other. To me designing and constructing Dobsonian travel scopes is the pinnacle of building Dobsonians. Before construction started, a lot of brain storming was going on during our weekly group meetings. Each aluminum profile cross section, each rivet, and each thread pitch were discussed thoroughly. 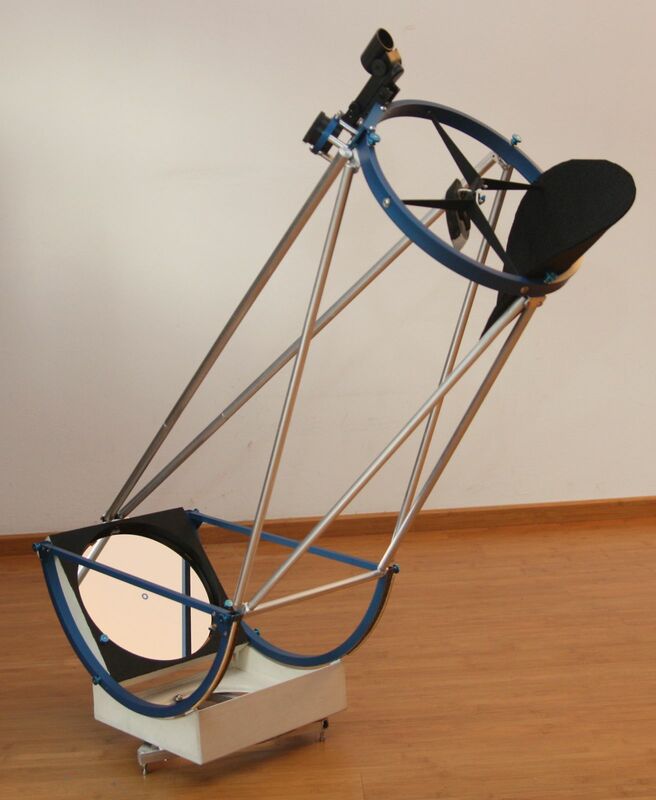 As a template we took the already existing 180 mm travel Dobsonian designed and built by Martin Brückner in 2010. Thanks to the available tools and machines at the Volkssternwarte Munich workshop, we were able to make even complex parts.